Tom and Minda selected the gorgeous Ballroom at Church Street located in the heart of Orlando Florida as their wedding venue. The venue features cathedral ceilings stain glass windows and beautiful chandeliers. Its location in Orlando also offers many wonderful photo opportunities for weddings. 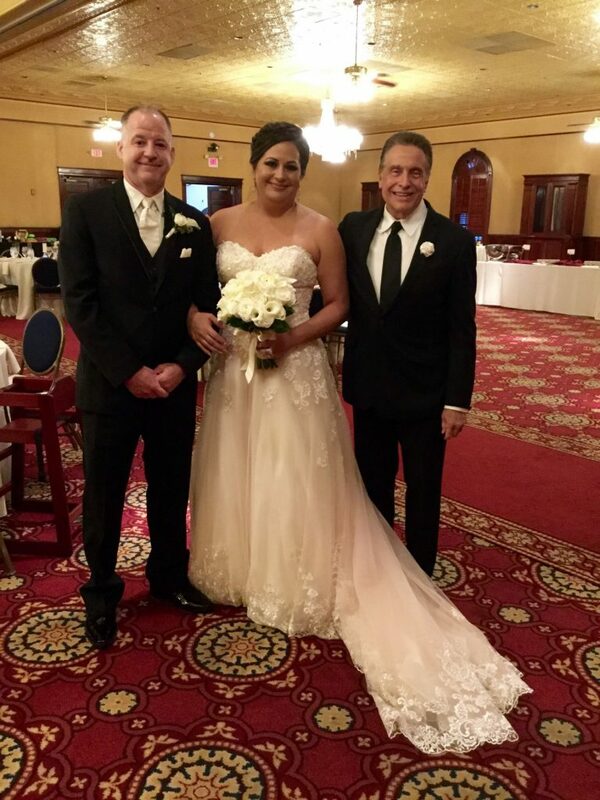 Lon Tosi of the Orlando Team of Sensational Ceremonies worked with the couple for nearly a year to develop a meaningful ceremony that truly told their story. They did not want a long event, so it was up to Lon to get into the true essence of what was important to the couple. And he did! They had a “Love Theme” ceremony with several readings that focused on the meaning of love. The reading What is Love speaks of the mystery of love and indicates that “Love is a promise that is always kept, a seed that can flourish in the most of unlikely of places” Another reading about love indicated that “It was love that brought you together to unite your destinies. Always remember how important your loving relationship is. Cherish you love forever”. That most memorable and poplar reading from Nightmare Before Christmas served as a transition between vows. It reads: “My dearest friend, If you don’t mind, I’d like to join you by your side, Where we could gaze into the stars And sit together, now and forever, For it is plain as anyone could see, We’re simply meant to be. So beautiful! An amazing group of vendors worked with the couple to make certain that they had a fantastic wedding experience. Married By Mail provided the couple with their Florida Marriage License. They actually hand delivered it to Lon for the wedding. Outstanding service! Sara from Serendipity Events did a masterful job of orchestrating the event. Things went off perfectly and on time! Puff’ N Stuff Catering provided the cocktail and reception menu items, and Sofelle Cake Artistry made that gorgeous and delicious cake! The flowers were provided by The Flower Shop Orlando. Magic Occasions served up the amazing beverages of the evening! We wish you much luck with your marriage Tom and Minda! You are off on a great adventure!